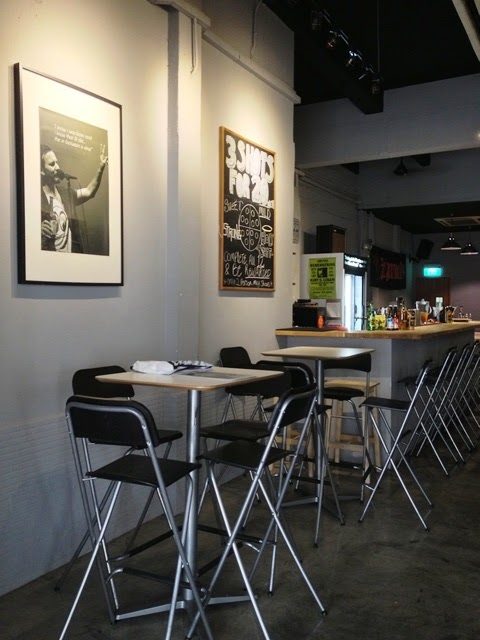 Third & Sixth is a bistro-bar down at Seah Street which offers premium draught beer, quality whiskeys and an interesting menu of calories-worthy food. There seemed to be no lack of F&B ideas and concepts budding up in Singapore and seemingly this summer it was all about dessert pastry cronuts with our home-grown version from Da Paolo and burger bistros. 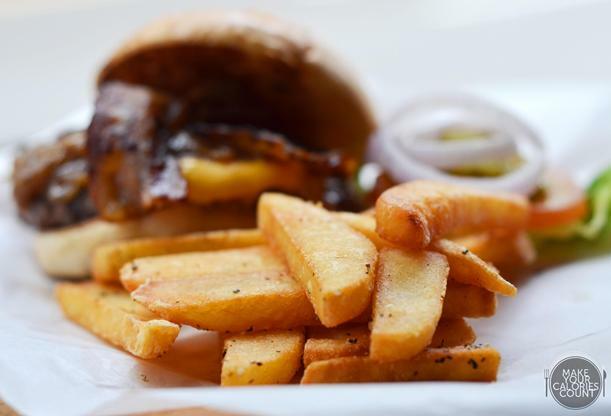 It seemed like many of the new burger chains were already well reported by bloggers and it certainly took us some time before we decided to drop by Third & Sixth as I was enticed by the pictures and promotions they had put up on their Facebook page. We dropped by after the usual afternoon lunch crowd had dispersed and managed to enjoy some peace and tranquillity at this inconspicuous looking bistro-bar. There was the lunch set menu being offered from 12-3pm and I felt that it was a real steal to get a starter, main and a bottomless iced tea drink at S$9.90/nett. 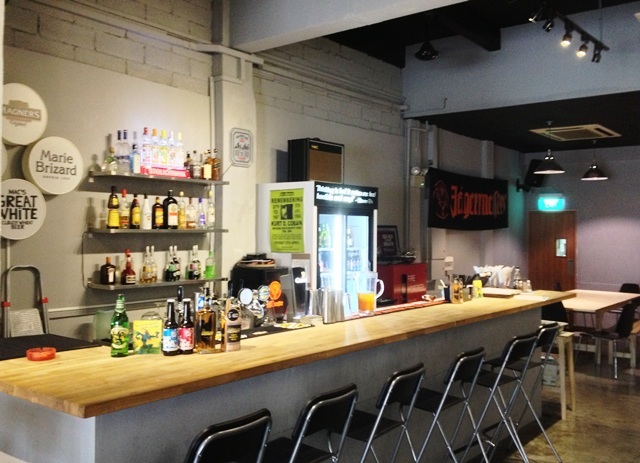 All the prices stated on the menu were nett, inclusive of GST and service charge. Upon being ushered to our table, Edward, which we later learnt to be one of the bosses attended to us and was more than patient in making recommendations and was elaborate in attempting to portray an insight of the types of food on offer. Just when I thought that this was a manly-fare with their list of burgers under 'The Main Reason' menu and choice of draught beers such as Asahi and Magners, I was in for a teaser when he introduced a separate menu - the Sinless Grub. No prizes for guessing but yeah it was a menu that featured healthier options for the weight-watchers yet delivering a sumptuous meal. Was that even possible? The list of starter dishes came under the 'Sideshows' category of the menu and this standalone would cost S$6/- when ordered ala carte. There were 3 starters to choose from the lunch set menu and in the appetite for some sinful indulgence, the nachos seemed too good to resist. The crunchy corn chips were served with home-made pico de gala, melted cheese and sour cream, topped with the all important chilli con carne. It seemed like a crime, almost, to give this a miss. 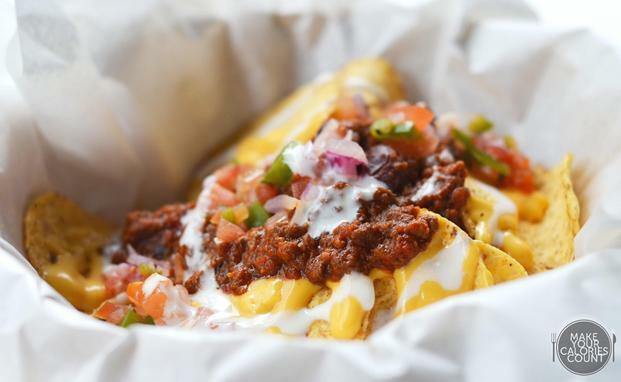 The nachos were crisp and crunchy with a beautiful corn flavour and the toppings worked harmoniously in terms of flavours and balance in tastes. The richness and intensity of the chilli con carne, a mildly spicy stew of chilli peppers, beef and beans was refreshingly complemented by the salsa. It seemed almost like a rare deal when the dish was served to us warm and that melted cheese was still runny-rich and viscous and not a state where it had already cooled and thickened. It was also interestingly served in a dim sum bamboo steamer tray which I thought was a clever form of presenting this Texan-inspired teaser. On the list of mains to choose from for the lunch set menu, you could also order this ala carte under the Sinless Grub under a slightly different name - Stan Winston's Head (S$9/-). 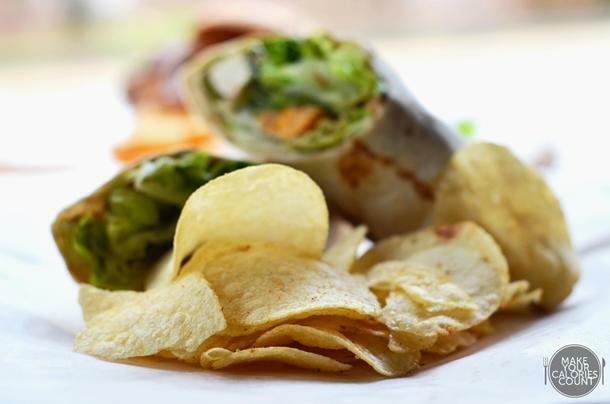 This fondly reminded us of our lunch days whilst studying at university where tortilla wraps somewhat became a staple food of ours, probably owed to calories-consciousness. 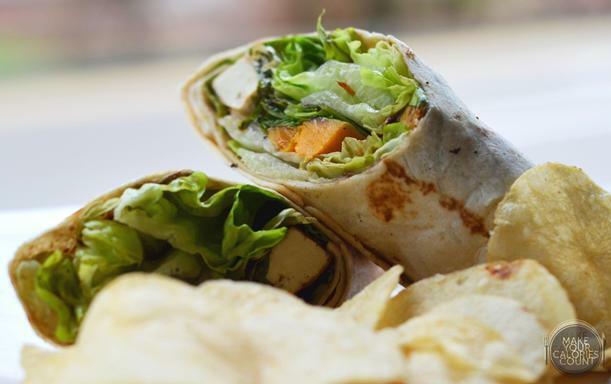 The soft tortilla wrap complemented the crunchy Romaine lettuce neatly tucked with the grilled butternut pumpkin and soy beancurd. There was a lightly saccharine dressing to keep the greens moist and delectable. One could not help but enjoy the cleanness of the dish and would make a beautiful main for the ladies or weight-watcher gents. The crisps served were simply plain salted and while it might seemed like a herbivore's meal, it was surprisingly filling for the portion size was pretty sizeable. I thought that the lunch set menu was really value for money and given several starters and mains to choose from, I would highly recommend it. 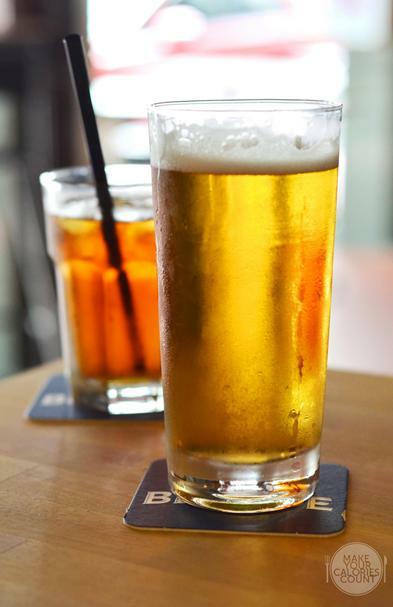 There was an ongoing promotion for the draught beers, each at S$8/- before 3pm and S$9/- thereafter till 9pm and S$12/- till closing. These brilliant chicken wings were offered in 2 different sizes, either 6pcs (shown here) or a dozen which comes at S$18/-. 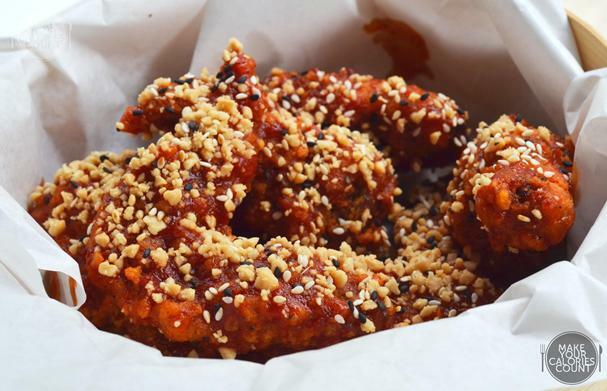 There was a lot going on upon the first bite, with a rich mildly spicy (with the use of Korean chilli paste) and sweet homemade sauce coating the wings and a nice layer of texture on top with the diced peanuts, white and black sesame seeds generously scattered. While I loved the texture and the balanced flavour which drew me to fetch a second piece, I would have enjoyed it more if the batter was crispier without the sauce causing it to be soggy. If there was one side which would go brilliantly with the beer, this got to nail it though there seemed to be no lack of contenders on the sides menu such as beer battered fish, calamari, onion rings or even shoestring fries with truffle oil! We were unable to finish the wings as we probably over-ordered but Edward kindly suggested that we could have the wings packed up for takeaway if we wanted and we gladly took up the offer! The whole purpose of visiting Third & Sixth was really to try their signature burgers and there was no way we could resist their trademark burger after it was strongly recommended by none other than the owner of the bar. 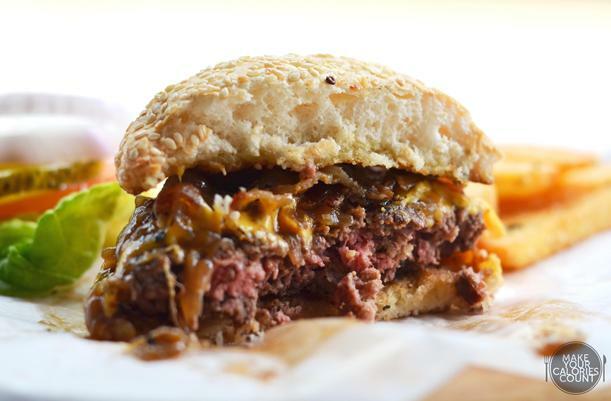 It seemed so simple, a home-made Australian grain-fed beef patty weighing 150 grams, slapped with caramelized onions, cheddar cheese and slices of crispy bacon to add texture to this savoury main. All of the beef patties were home-made daily with chilled beef and not the usual frozen patties so expect freshness in each and every slab of protein. Served together with steak-cut fries that were crispy on the outside and soft on the inside, it was a sinful indulgence to enjoy it with a pint of beer on a hot afternoon! 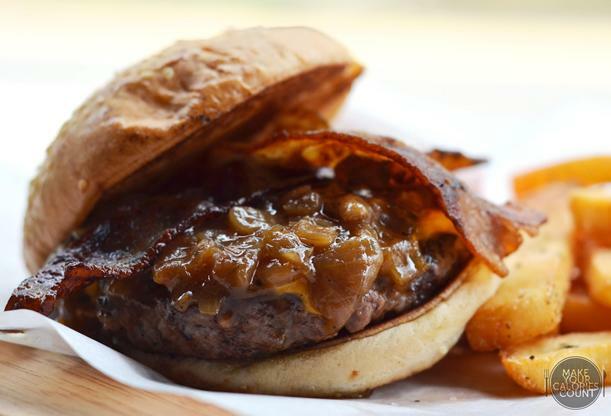 The savouriness of the melting cheddar cheese was nicely enhanced by the sweetness from the soft caramelized onions. I enjoyed the patty as it was cooked to perfection leaving a slight pinkish rawness but retaining all the much desired moisture to keep it succulent. The only concern was the burger bun which felt fluffy, airy and light which I thought would be improved with a denser bun but then again I am sure some would argue that they prefer the way it is now. As always, taste is subjective! One of the reasons why I enjoyed my visit to Third & Sixth was the versatility of the menu which gave a very casual and relaxed setting. I was able to request for a kimchi add on to my burger but enjoyed it in a separate side dish. 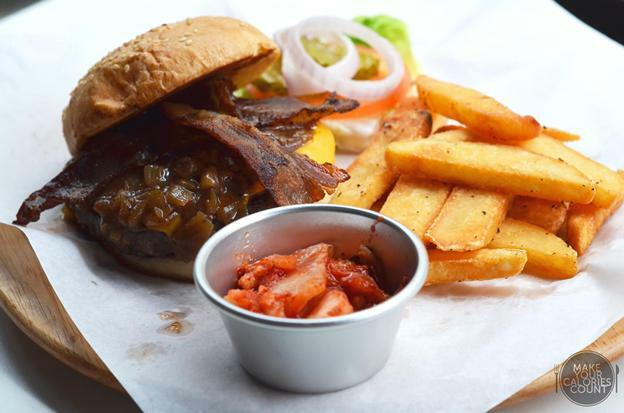 There were several other add-ons possible such as an additional chicken or beef patty at just S$4/-, an extra serving of caramelized onions or even bacon strips. I highly recommend the kimchi though because it was an interesting twist to the Western fare of burgers and chips. I was actually going to order the Jong Un which was a beef patty served with kimchi sandwiched between the buns. The kimchi was served cold and even the metallic container was cold in order to help it retain the cool temperature. Admittedly, I am not a fan of kimchi and this was one of the very rare occasions where I actually got past the first taste and went on to finish that small tub! It was on the spicier side which helped to titillate one's senses and I would love to try it on the burger next time! There was a reason why the kimchi tasted so good because the owner is half-Korean and his mum runs her own Korean restaurant. This side basically carries the same recipe but do you know where it comes from? On a side note, I was told you could even replace the beef patty with chicken at no additional surcharge! There seemed to be plenty of exciting events coming up at Third & Sixth. The owners of this bistro-bar used to play together as a band and they are looking to bring it back sometime end July or early August 2013! While the interior décor was simply illustrated with chalkboards and occasional ornaments, I could certainly see the extra savings on my bill. 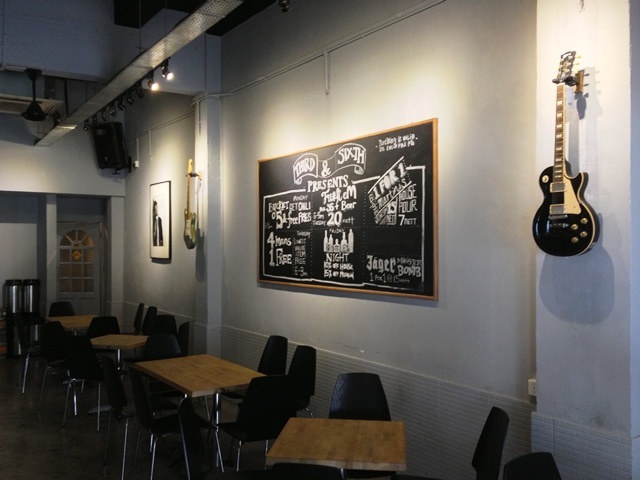 A good playlist of music throughout the lunch, attentive customer service, good quality food and affordable prices, I think I just discovered a new place to hang out! It was worthy of our calories so I would recommend it!